The work was commissioned by Cardiff National Eisteddfod 2018 to be performed twice during the Eisteddfod week - Friday, 3 August and Saturday, 4 August in the Wales Millennium Centre. Libretto by Mererid Hopwood and music by Robat Arwyn. Directed by Betsan Llwyd. Sir Bryn Terfel is the star of Hwn yw fy Mrawd, a biopic depicting the life of actor and singer, Paul Robeson and his strong links with Wales. We follow Robeson’s life through the eyes of his greatest fan, Mr Jones, played by Sir Bryn Terfel, as he regales Twm, a young man searching for a hero, with stories of Robeson’s fight against oppression. Twm is portrayed by Steffan Cennydd, and other soloists include former national winners, John Ieuan Jones, Elain Llwyd, Elin Llwyd, Steffan Prys Roberts and Mared Williams. They are joined by renowned Birmingham ensemble, Black Voices, winners of the 2016 National Eisteddfod Festival Choir, Côrdydd, a youth choir from the Eisteddfod area, Treorci Male Voice Choir and dancer, Matthew Gough. 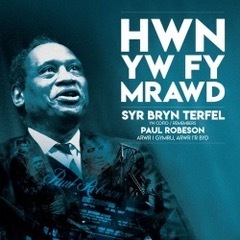 Friday evening’s performance takes place sixty years to the day since Paul Robeson addressed the Eisteddfod crowd at the 1958 festival in Ebbw Vale. Caneuon y Wladfa - A music book which includes two songs by Robat Arwyn and Hector MacDonald, celebrating the cultural and linguistic links between Wales and Patagonia. Lyrics by Tudur Dylan. SATB version of Cerddwn Ymlaen's 2015 campaign single, originally recorded by Rhys Meirion and Côr Rhuthun. 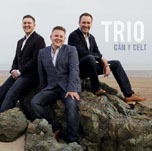 After the continuing success of their debut album, this second collection is further evidence that Trio can excite and mesmerise as they sing new and familiar songs, in Welsh and in English, and appeal to a wide audience. One of the songs on this new collection is Dal y Freuddwyd. 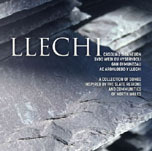 This collection of songs is testimony to the thriving musical tradition of the magnificent slate valleys of Gwynedd including an arrangement of Cerdded Hyd y Llethrau sung by Lleisiau Mignedd. 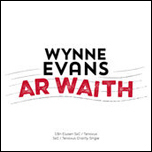 In his recent series, Wynne Evans ar Waith, the popular singer created a choir with members from three of Wales' largest companies: Welsh Water, Arriva Trains Wales and Edwards Coaches. As part of the series, Wynne and the choir recorded a specially commissioned song by Robat Arwyn and Hywel Gwynfryn, Cân heb ei Chanu. Wynne is a patron of Tenvous and all proceeds from the sale of the downloads will go to this charity. Piece commissioned by Urdd Gobaith Cymru and Tŷ Cerdd for the mixed choir competition in the 2014 Urdd Eisteddfod. SATB version. Piece commissioned for the mixed choir competition in the 2011 Wales Young Farmers Eisteddfod. Music and Welsh words by Robat Arwyn, English words by Aled Lloyd Davies. SATB sheet music. This is Shân Cothi's first album since 'Passione' in 2005. Joining her are a variety of popular singers and instrumentalists including Catrin Finch, Rebecca Evans, Steffan Morris, Rhys Watkins, Rakhi Singh and Benjamin Baker. One of the duets on the ablum is Shân singing Anfonaf Angel with Wynne Evans. A collection of new recordings of ladies, male and mixed voice choirs including Hogia Llanbobman (Anglesey), Côr Eifionydd and Côr Merched Lleisiau’r Cwm (Amman Valley). Included is a new recording of Adre'n Ôl by Côr Dre from Caernarfon. Originally from Dryslwyn near Llandeilo, Ffion is one of Wales’ talented young voices who won the David Ellis Memorial Prize, the Blue Riband at the 2015 National Eisteddfod at Montgomeryshire and the Marches 2015. This first recording is a reflection of the wealth and flexibility of Ffion’s voice, and her desire to reach the heart and soul of her audience. Included in this collection of Ffion's favourite songs is Anfonaf Angel. Having received over 1,500 votes for nearly 500 different songs, here is Radio Cymru's '#40MAWR 2015' chart – BBC Radio Cymru listeners' favourite songs of 2015. Rhys Meirion singing Anfonaf Angel is at #3. The Cerddwn Ymlaen campaign's single for 2015. Robat Arwyn and Tudur Dylan composed the song, and joining Rhys and the choir on the recording are Rhys Taylor on soprano sax, Annette Bryn Parry on keyboard, Graham Land on drums, and Robat Arwyn on piano. This is a charity single for organ donors with proceeds going to Elen's Fund. 60 classical hits featuring some of the world's best know classical singers, including Bryn Terfel and Rhys Meirion singing Benedictus. Bro Aled is a cluster of rural communities nestling in the Hiraethog mountains. This is the area that joins the Conwy and Clwyd valleys and home to the choir members. This is the choir's 5th collections and contains a commissioned piece Dyma Gariad Fel y Moroedd. This is a varied collection reflecting the type of songs this popular and prolific choir enjoys singing. It includes their arrangement of Anfonaf Angel. A new compilation sung by artists such as Bryn Terfel, Leah Owen, Côr Seiriol and Rhys Meirion. "The renowned tenor Rhys Meirion and composer Robat Arwyn first worked together as members of Rhuthun Youth Choir, and their friendship has blossomed into a musical partnership which gives this recording a very special quality. Rhys has wanted to make an album of his friend’s compositions for some years, but the tragic loss of his sister Elen Meirion gave an added impetus to the project. Rhys asked Robat to compose a song in Elen’s memory, to words by Robin Llwyd ab Owain, and the result is the first track on this unique album – a tender tribute to a very special person. Robat is heard on this album as a singer in his own right, and as an accompanist, and Rhys’ daughters Elan and Erin are also featured, Erin as a member of Parti Dyffryn Clwyd – a young choir we will certainly hear more about. Together, they make for a very special album indeed." Taken from the introduction to the album. I'm pleased to say that a new CD of my songs has been released on the Sain record label. 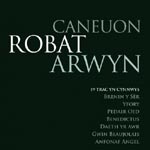 From Sain's website "This compilation brings together 19 recordings of choirs and soloists and ensembles as a celebration of the art of Robat Arwyn, including ‘Benedictus’ which was a hit for The Priests, and ‘Anfonaf Angel’, the haunting song which will now always be linked to the Wales Air Ambulance service."